If you’re like me and have played the killing game visual novel that is Danganronpa, you could be forgiven for expecting the same kind of death-filled thriller from Zanki Zero. While Zanki Zero does carries similar ideas in its own way, it also brings in its own set of outlandish ideas that set itself apart from the Danganronpa team’s previous work as a unique game of its own. In a post-apocalyptic world that touches on immortality and cloning tied together with characters representing the seven deadly sins and a new duo of quirky mascots, the concepts introduced in its Japanese demo got me very excited for when it comes out thanks to how it took the concepts I loved from Danganronpa and turned them upside-down to make what looks like a new story like nothing I’ve played before. The way Zanki Zero introduces its concepts starts with the story messing with our perception of how death actually works. The story begins with the shocking moment of a character jumping off a building, but what’s shocking about it isn’t just the fact someone is jumping off a building, rather that the result we expect never comes. Rather, the character awakens on Garage Island, alive and seemingly well, with something instantly amiss in the story. Like the masterful way Danganronpa unfolds, through these twists and turns Zanki Zero reveals its premise: the world full of buildings like the one our starting character jumps off has been destroyed and this Garage Island is inhabited by the eight remaining survivors of humanity. This idea alone was enough have me surprised, but then through a few more surprising moments, it reveals the second part of its premise: these eight survivors are clones and on top of that, can have their lives extended when they die. It turns out their bodies have a 13-day lifespan in which they experience their lives as children, adults, middle-aged adults and finally as an elderly person and after they die, they can be reborn using a machine called the Extend Machine to essentially give themselves a ‘1-up’ in life (game’s words, not mine), with their memories all in tact. As a story concept, the idea is unique enough by itself, but what makes things even better is the concept of extending life through a machine is one of the main game mechanics in Zanki Zero. 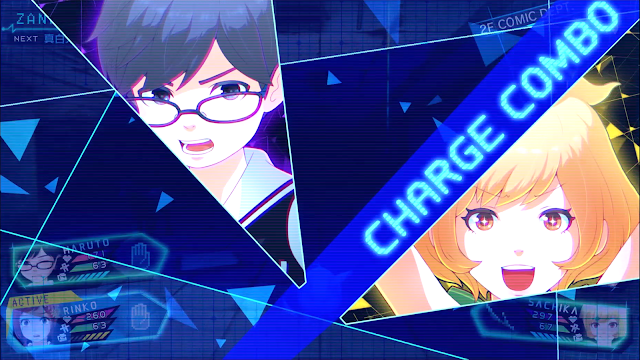 While there are plenty of big, long story sequences that give a nod to the visual novel-style gameplay we already know from the Danganronpa team, Zanki Zero is actually an RPG with its own action combat and skill mechanics and these mechanics link to the clone’s life cycle into a few different ways. As you travel through dungeons to gain materials and complete missions to help survive in its post-apocalyptic world, each floor you explore uses up one in-game day of time once you hit the next one, consequently aging your clone a day older. Depending on the age, this can mean your character physically age, with your characters able to move and fight differently depending on if a character has the body of a child or that an elderly person. For example, a child’s body is physically weaker, but has the benefit of being able to fit into small spaces, whereas elderly bodies are also physically weak, but know how to charge attacks quicker. All of this has the fun, extra benefit of being able to see what each character looks like at these ages and being able to see what these characters looked like while also learning how they played made it interesting to get to know each body type. While I wasn’t able to explore the size mechanic deeply in the demo I played, the team said in a Zanki Zero panel that there are places that only characters of child size will be able to explore, meaning you’ll need to have very young clones to be able to explore them and possibly need to shamelessly kill off some of your older characters to rebirth them as children, which the game happily presents in its rebirthing system in the form of its Extend Machine. 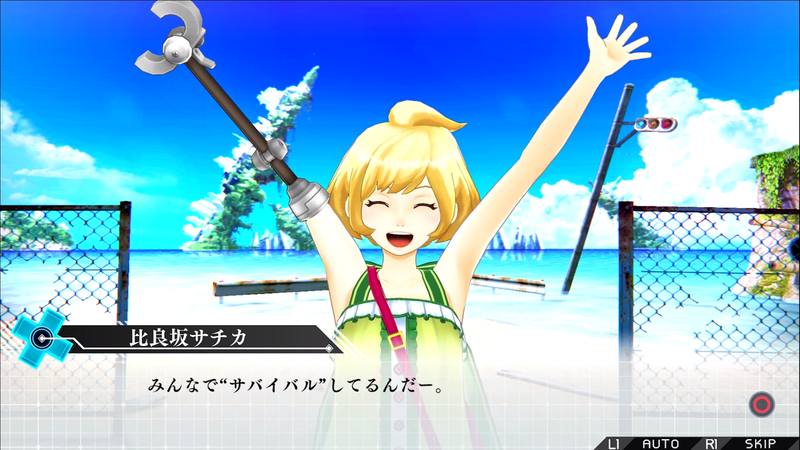 Zanki Zero’s Extend Machine also has another system for using death positively in the form of its Shigabane system. The Shigabane system gives benefits to a character’s next body based on how they die, with ways to die including from old age, eating a food they’re allergic to or from getting killed by a monster, with the game proudly proclaiming there are over 100 ways to die in it. The type of Shigabane benefit given is usually a resistance or buff based on the way they died, with an example given at the Zanki Zero panel being if a character dies from being poisoned, they’ll have a better resistance to poison in their next incarnation. I got to see a little of this mechanic in action towards the end of my time with Zanki Zero’s Japanese demo - after playing its generous eight hours, I decided to keep exploring to see just what would happen if I let one of the clones die to extend its life. I went one floor too high, which made my older party member Minamo become 14 days old and being one day beyond her 13-day life span, she consequently became “dead”. When I reached the Extend Machine, Minamo had gained two Shigabane - one a general stat boost for dying of old age and since she died in elderly form, the other was an extension to the middle-aged portion of her life to give her more time in a stronger form. Despite that fact that I’ll have to have her in child form for a few days before I can gain the full benefits of these Shigabane, her temporary death ultimately made her more useful. So in a bizarre fashion, rather than making me sad, Minamo’s death makes her a better party member and feeling this way about a character dying is definitely something unique that I can’t recall from any games I’ve played recently. As a final note, I also find it interesting as a big fan of Danganronpa that this is the game they chose to make after Danganronpa. The potential death of characters was something constantly looming in each chapter of Danganronpa as something emotional and fearful, ultimately as something I hoped wouldn’t happen. Meanwhile death of characters in Zanki Zero is also constantly looming and inevitable as clone lifespans are only 13 days long, but the life expansion mechanics removes the fear and makes it a good thing. The death of characters means getting stronger with your next Shigabane and with certain areas being accessible to certain clone body types, it’s basically an essential part of the gameplay in a way that I can see making it shamelessly necessary to kill these characters at many different times in the story. Zanki Zero sees Danganronpa’s team turn death into its own mechanic and with the twists and turns in its story and world partnered with the dark humour surrounding this concept and world in a way I’ve come to expect from the games this team create, Danganronpa’s team have somehow managed to turn something I used to fear in their games into something I’m really oddly excited to play around with. 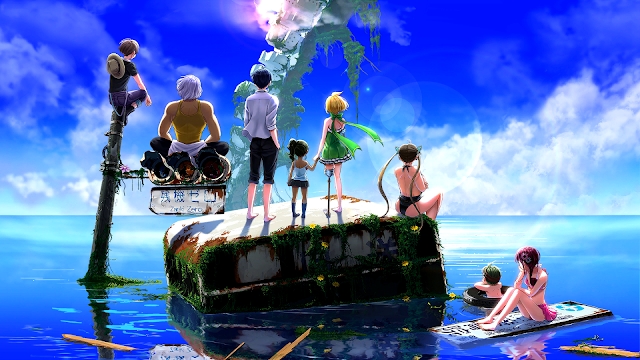 I knew there was a good chance I’d like Zanki Zero because it was by the Danganronpa team, but the life-extension concept, its world and the way it ties into game mechanics have made it one of my anticipated games for next year so far. From what I saw in its Japanese demo, these concepts are combined with exploring its interesting characters stories and despite how often I’ll probably watch them die, I’m looking forward to learning more about them, their world and how they’ll tie in with its ideas. While Zanki Zero is a long way off, I’m glad this unique game with intriguing concepts is coming to the West next year and whether it’s through a demo, more trailers or otherwise, I hope other people come to enjoy what looks to be a fascinating new IP. You can pre-order Zanki Zero on Amazon! Do you think Zanki Zero sounds good? Do you think you'll try it?